I shall fear no bad stuff, for you are in the general vicinity are hanging out are my Main Man support me. I praise thee with harp. I figure even you are annoyed by accordion. Lord, don’t hide your face from me. I seek you in the morning, looking for solace. I seek you in the afternoon, searching the cupboards of my heart. Lord, you play a mean game of hide and seek. Who may approach the mountain of the Lord? Who may stand in God’s Holy Place? they shall find help from the Eternal. but I trust you have plan to make this all work out somehow in you for no good reason I can see because your “goodness” never ends. Give thanks to the Lord, For it wins votes. For God’s Love is everlasting. Give thanks to the Lord, for it makes the chicks swoon. Give thanks to the Lord, cause it beats digging a ditch. From out of the depths have I called you, Lord. In my time of travail did I write. I have visited your shrine, and prayed at your holy mountain. Do you ever call? Do you ever write? and all your paths are in need of some capital reconstruction. [note to self, must talk to chamberlain about infrastructure bond]. You are without measure, beyond compare. So I guess I better stop writing. 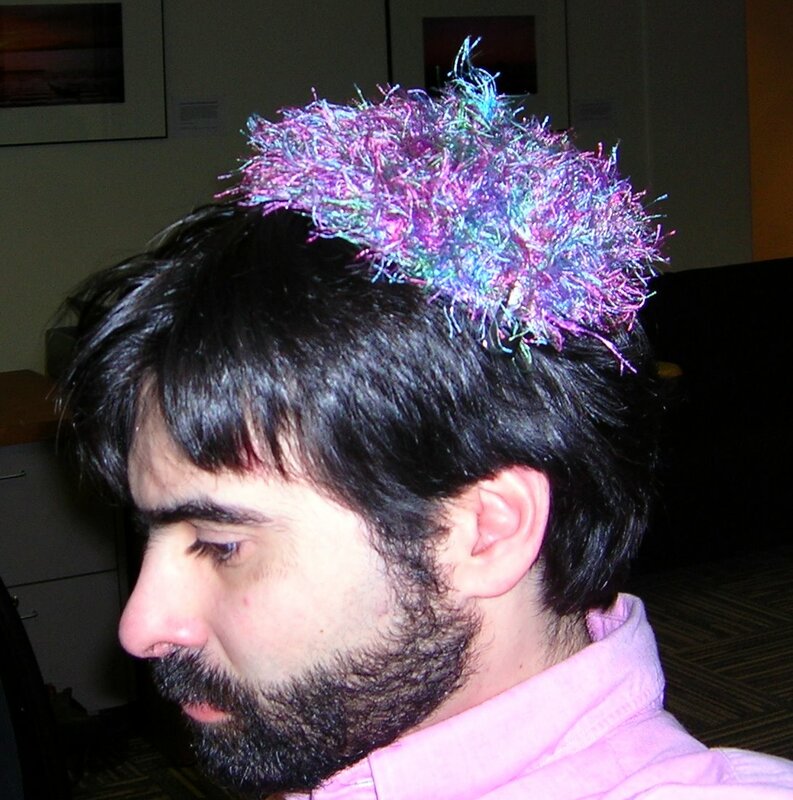 I made a it a few years back out of some Fun Fur, back when the only thing I knew of to do with yarn was to make a kippah. How long should one knit as a preparation for writing? Rabbi Hillel says one should knit until the words flow smoothly. Rabbi Shammai says, two rows. Rabbi BagBag ben BarBar explains: it is the length of two rows for a scarf. Rabbi EZ* say: but I am knitting in the round: how do I know when I am to stop. The rabbis teach that no rules apply to Rabbi EZ. But for those of us who are not of her merit, how do we know when to stop if we are knitting in the round. The School of Shammai teaches that one should never knit in the round. Never knit in the round? What about socks? “Are they then to be called Clan McShammai?” scoffs Rabbi EZ. Anyone may wear Argyle says the school of Hillel. Only those whose Torah learning is great and whose knitting knowledge is greater says school of Shammai. Only those of Scottish ancestry may wear Argyle says the School of EZ. *For the non knitters: Elizabeth Zimmerman (who is as Hillel to the knitting tradition). **For the non-knitters: argyle socks are knit flat, and then sewed up the back: they are persnickety beyond belief are require handling between four and eight balls of yarn simultaneously. I am, once again, working on Eva’s socks. And I find myself increasingly confused by how they are turning out. I like them, don’t get me wrong, I just don’t understand how they are doing what they are doing. Two key issues are confusing me: 1. how is it that when I spiral the ribbing, the purl stitches stick out further than the knit stitches? 2. I reduced needle size to make the calf a touch smaller…why does it not appear to have changed my gauge at all? I could point out where I changed the needles on the picture, but really, what’s the point? When people looking closely in person can’t tell the difference in gauge, I figure there’s no way to see it from the picture. So I am left with the knitters final option: acceptance. I accept that I do not control the knitting, but that I am the vehicle through which the knitting flows. The knitting will be as it wishes to be, and I will help it come into being. (It might be worth pointing out, Purim happens later this week; Purim is a holiday of frivolity, joy and humor). And so, I wait as I knit to find out what is going to become of these socks.